This post is written by Maggie Mecklenborg, public relations and sales intern for Experience Columbus. You can follow her on Twitter @MaggieMeck. Is it 5 o’clock yet? After a long day at work it’s time to head over to your favorite Short North spot to sip on a couple of drinks and snack on some appetizers. Here are six places in the Short North Arts District that are sure to make your happy hour extra happy! 1. Rigby’s - Rigsby’s happy hour starts at 4 p.m. during the week and includes great drink specials. Mondays, the bar menu includes oysters on the half-shell for $1 each, Wednesdays feature grilled cheese starting at $5, and Thursdays brings a new chef&apos;s creation centered around lobster. 2. Marcella’s Ristorante, Pizzeria & Wine Bar – Marcella’s offers half-off selected food, wine and cocktails Monday-Friday from 4 p.m.-6 p.m. in the bar area and cocktail lounge. 3. Bakersfield- Word around Columbus is that Bakersfield has “the best damn cheap margaritas in town.” With $6 Mason jar margaritas, $3 daily chalkboard shots and $2 pints of PBR served in glass cowboy boots, you can’t pass up all the tacos, tequila and whiskey that this Tex-Mex bar and restaurant has to offer. 4. 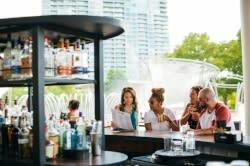 The Pearl – The Pearl’s happy hour is Monday - Friday, 4 p.m. - 6 p.m. and includes half-off select beer, wine by the glass, cocktails and punches, and selected spirits. They also offer a happy hour snacks that range from $2 - $4 dollars and includes smoked salmon, old-fashioned deviled eggs and oysters. More on The Pearl here. 5. Bodega – Bodega’s happy hour rocks the beer lover’s world! Every Monday – Friday from 4 p.m. to 8 p.m. there are more than 50 beers on draft that are half-off! NOTE: Bodega is closed for remodeling in February but will be back up and running soon! 6. Martini Modern Italian – On Monday – Friday from 4-6 p.m. Martini offers $5 martinis and half price appetizers. Some of the appetizers include parmesan-covered beef carpaccio ($7), bruschetta ($4.50) or pan-seared sea scallops with mascarpone polenta ($7). What&apos;s your favorite spot for a happy hour in Columbus?